Hanoi (VNA) – What Vietnam has achieved in 2017 have created important prerequisites for the country to continue implementing successfully objectives and tasks set by the 12th National Congress of the Communist Party of Vietnam. The statement was made by President Tran Dai Quang while granting an interview to the press on the threshold of the New Year 2018. 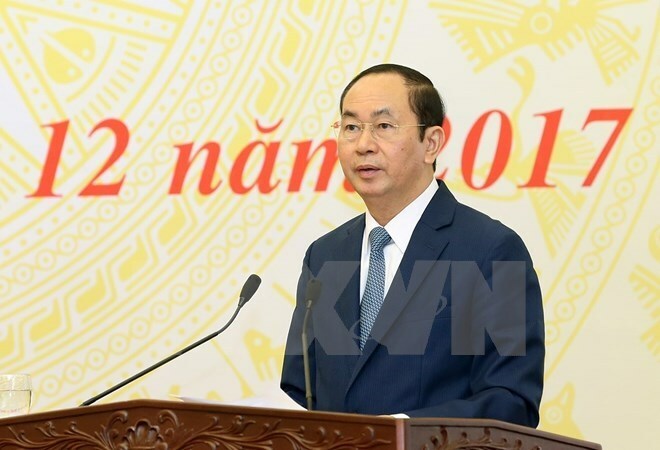 He said 2017 was the first time in many years Vietnam had met and surpassed all 13 socio-economic development goals set by the National Assembly. The macro-economy was stable, inflation was controlled, and budget collection and major balances of the economy met their respective targets. While GDP grew at 6.81 percent, export-import reached the highest-ever turnover of 425 billion USD and a record of over 33 billion USD of foreign direct investment was attracted. He also highlighted encouraging attainments in social affairs, particularly poverty reduction and health care, enhanced defence and security, and ensured political security and social order and safety, along with significant outcomes in the building of the Party and the political system. “The relatively comprehensive achievements in different fields helped reinforce trust, create an excited atmosphere in the entire society, and provide a favourable momentum for the country to continue developing sustainably,” President Quang said. He also described 2017 as a special year in Vietnam’s diplomatic history, underlining the huge success of the APEC Year 2017, with its peak being the 25th APEC Economic Leaders’ Meeting. As the host of the Year, the country made a historic milestone in the economic-political connection progress in Asia-Pacific while showing its stature, firmness and wisdom. The APEC Economic Leaders’ Week in the central city of Da Nang on November 6-11 turned Vietnam into the focus of the world’s attention. It saw the presence of all leaders of the APEC economies, the leaders of the guest nations of Laos, Cambodia and Myanmar, and more than 11,000 delegates. Over 21,000 people attended activities of the APEC Year 2017. That showed Vietnam’s great strategic position and role in the region, the member economies’ commitment to APEC cooperation, and the international community’s interest in APEC and Vietnam, President Quang said. He told the press that what Vietnam achieved in the APEC Year 2017 also laid a foundation for the country to elevate bilateral relations with partners. Historic visits and tens of talks and bilateral meetings took place during the Week. Particularly, General Secretary of the Communist Party of China and President of China Xi Jinping paid a State visit shortly after the party’s 19th national congress. Meanwhile, Donald Trump became the first US President to make a State visit to Vietnam in the first year of the term. In 2017, Vietnam bolstered cooperation with neighbouring, regional and major countries as well as nations it has traditional ties with, the leader noted, adding that leaders of Vietnam and other countries made a number of mutual visits. Notably, there were tens of high-level visits between Vietnam and leading regional and global nations. It was the first time in history Vietnam had welcomed the leaders of China and the US on their State visits in one day. Amid the global economy’s unstable recovery and growing trade protectionism, Vietnam strongly promoted economic, trade and investment ties with other countries in both bilateral and multilateral aspects and greatly helped with the shaping of economic-trade connections in the region. During the APEC Economic Leaders’ Week, the country played an active role in maintaining and promoting the negotiation on the Comprehensive and Progressive Agreement for Trans-Pacific Partnership (CPTPP). Meanwhile, in ASEAN, Vietnam paid a critical contribution to the enhancement of solidarity, consensus and common voice in the region’s strategic issues. Security-defence dialogue and cooperation mechanisms with neighbouring, regional and major countries, Vietnam’s active engagement in multilateral forums on security-defence, and its participation in UN peacekeeping operations increased the political trust between Vietnam and other countries, thus helping to raise the nation’s standing and prestige in the international arena. In addition to hailing the country’s remarkable achievements in domestic and external affairs, the President pointed out shortcomings that need to be addressed in the coming time such as low growth quality, cumbersome administrative procedures, corruption, wastefulness and negative phenomena, inefficient investment projects, and snail-speed restructuring in agriculture, industry and services. He also mentioned wasteful use of natural resources, environmental pollution in rural areas and craft villages, natural disasters, along with child abuse and domestic violence. The life of ethnic minority people in remote and natural disaster prone areas is still difficult. The National Assembly has approved main socio-economic development targets for 2018, including striking a GDP growth of 6.5-6.7 percent, ensuring macro economic stability, curbing inflation, reforming growth model in lien with economic restructuring, and improving growth quality, labour productivity and economic competitiveness, he said. According to the State leader, Vietnam holds great potential for further development thanks to its socio-political stability, increasing prestige in the global arena, and significant accomplishments after over 30 years of “Doi moi” (reform). He called for stronger solidarity and self-reliance to tap opportunities and overcome challenges to develop the country as well as protect the national independence, sovereignty, unification and territorial integrity. Mentioning the fight against corruption and wastefulness, President Quang said many serious cases were brought into light and strictly handled in 2017 thanks to the drastic direction of the Communist Party of Vietnam (CPV) Central Committee, the Politburo, the Steering Committee on corruption prevention, the efforts of competent agencies and the support of people. Preventing corruption and wastefulness will continue to be a key task of the country in 2018 and the following years, he stressed. It is necessary to implement more effectively resolutions adopted at the fourth meetings of the CPV Central Committee in the 11th and 12th tenures on strengthening the Party building, he said. Each official and Party member must take the lead in corruption and wastefulness prevention and the fight against crimes, including economic and corrupt ones, contributing to building strong and transparent Party, State and political system, he added. On the threshold of the New Year, President Quang wished all people at home and abroad good health, happiness and success.